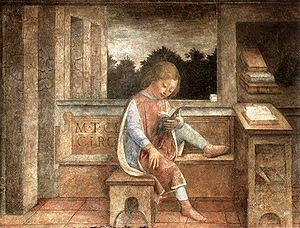 The Young Cicero Reading. Vincenzo Foppa. Fresco, 1464. "You are now at a university where many of the greatest men have received their education," Adams reminded him. He must attend all the lectures possible, in law, medicine, chemistry, and philosophy. . . [Adams] sent a gift of several volumes of Pope, and a fine edition of a favorite Roman author, Terence, in both Latin and French. "Terence is remarkable, for good morals, good taste, and good Latin," Adams advised. "His language has simplicity and an elegance that make him proper to be accurately studied as a model." On hearing that John Quincy's course studies did not include Cicero and Demosthenes, Adams could hardly contain his indignation. John Quincy must begin upon them at once, he declared, "I absolutely insist upon it." Latin and Greek were not all that mattered. John Quincy must neither forget nor fail to enjoy the great works of his own "mother tongue," and especially those of the poets. It was his happiness, too, that mattered. "Read somewhat in the English poets every day. You will find them elegant, entertaining, and constructive companions through your whole life. In all the disquisitions you have heard concerning the happiness of life, has it ever been recommended to you to read poetry?" ". . .You will never be alone with a poet in your pocket. You will never have an idle hour." What might Mr. Adams make then of the college student today, not only unable to quote Shakespeare, but unable to recognize him? Of one who reads neither the Greek nor Roman languages and cannot recall the histories of either? What of a woman, B.A. in hand, who would not know what to make of being called a Porphyria, a Portia, or a Penelope? What should we make of a graduate who knows not a whit of Keats or a phrase of Mozart? We might say that when such a person reads, he has nothing to compare it to. When he writes, he has no model for elegance. When he hears music, he cannot say whether it is more harmonious or rhythmic than anything else. When he sees an item in the newspaper, he cannot say whether, one time ago, a similar event happened with a similar cause. What one might most generally say is that this individual lacks the ability to make an analogy, perhaps by lack of intellect but at least by lack of information. We might say that lacking any knowledge of what has happened, exists, or is possible, this individual cannot assess the significance of what he perceives. Is is rare, commonplace, ugly, beautiful, dangerous? We immediately see a bifurcation between general knowledge (1) and specialized, vocational knowledge (2). The former is what presently concerns us, though I would preface by noting vocational education should succeed that which is defined in part one, i.e. reason and judgment should precede all other study, be it of the law, medicine, farming, et cetera. For part one (1) of our definition I first draw your attention to the concept of "developing the powers of reasoning and judgment." One recalls the tired teachers' platitude that they, "do not teach you x, y, or z, but rather teach you to think." Do they, in fact? Are students taught principles of "thinking," about concepts, precepts, first principles, causality, epistemology, dialectic, or logic? Even in philosophy courses these issues take a back seat to the more appealing ones. Who wants to grind through formal logic and Aristotle's Physics when you can read Socrates being clever in The Republic. And when one reads The Republic, what is easier to focus on: whether the state should ban bad books, or whether dialectic is itself a valuable epistemological tool? Issues of morality and ethics are more fun to debate because everyone has an opinion of them, though to be taken seriously they must stand on epistemological and metaphysical foundations. Understanding of such principles requires time and patience. The worksis inglorious, and the rewards may seem always far off, though "it is wonderful how might may be done if we are always doing." How many people can claim to have been taught these principles? The are usually only two systematized approaches to thinking offered students, broadly referred to as "the scientific method" and the "geometric proof." Sadly, both are explained without a philosophical context and only applied within their respective realms. It is as if to say to the student, "in these two fields, (or even more specifically, "in these two classes") we have strict methodologies about making, testing and substantiating claims about the world. Outside of these fields, good luck!" Of course the positive significance of teaching these two rational methods must not be overlooked. Consider the great technological achievements achieved in spite of a lack of overt training in "thinking". Yet one need only listen to a scientist, even a fine and successful one, even perhaps the greatest of his era, express his views on something outside his field to learn that philosophical poverty (and its dangers) may be the concomitants of this selectively-applied, strictly "scientific" reason. To quote economist Thomas Sowell, "The problem isn't that Johnny can't think, it's that Johnny doesn't know what thinking is." Indeed. Students are not taught any systematized way of making sense of the world thus they do not in fact know what it means to "think" about something. We must be wary in judging a culture by its art. True, art can be considered a barometer for values, yet we must consider whether art that is famous or, even art that is excellent, whether or not it necessarily reflects the values of the people of the society that produced it. We must consider a culture's best and brightest independently from the hoi polloi, not necessarily because their values differ but because the latter group lacks the resources (leisure or intellect) to appreciate some art. Continuing, part two (2) of our definition concerns "general knowledge." What a society considers "general knowledge" defines its ethos and character, i.e. its heroes, villains, its stories, music, literature; even sayings, euphemisms, superstitions, myths, et cetera. With our earlier observations in mind, what can we say is "common knowledge" for "educated," i.e. college-educated, people? One might say, that which is taught to everyone in college, i.e. the baseline college education; in other words, that which today constitutes a Bachelor of Arts degree or a liberal education. As far as I can tell, the meaning of the BA is indiscernible, suggesting neither a particular body nor degree of knowledge. Culturally, though, what is the impact? A culture where you cannot discuss Shakespeare or Mozart with a college graduate. One where a single chord that should wring the heart and would have set a scholar from generations ago to exclaim, "Beethoven!" goes unrecognized. Perhaps most conspicuously absent, so conspicuously on account of its long history and esteem, is Classical knowledge. Stories, myths to some cultures and simply examples to others, that have bound and permeated Western Civilization for the last 2,500 years and more are now not part of the common cultural ethos. Who would be touched to be called a Pylades or a Hypermnestra? Does invoking the name "Hecate" conjure up the thoughts for people today as it did for past readers? Even in the 18th and 19th centuries, amidst the burgeoning of science and the enlightenment, Greek and Roman stories flourished in art. One could fill pages listing merely the operas based on Classical themes and characters. The people of those eras had no pretense such stories told happened, i.e. the stories were not myths to these people, but they retold them because those stories said something important, about the world, about man, his nature, strengths, weaknesses and so on. I would theorize also because these stories were theirs as Westerners. It was their inherited tradition, the Western way of understanding the world and how they thought man should live in it, and it was their gift to enjoy, their challenge to increase, and their duty to pass on. Without the same body of stories, historical or mythical, how to understand Mozart recalling Shakespeare, Shakespeare evoking the name of a Roman king, or Gluck quoting Tasso quoting Homer? More practically, who would know the difference if you called the president a Honorius or a Cincinnatus, called a battle a Cannae or a Zama? The difficulty of course was that the characters had different stories and different traditions, but what if Picard had none? The episode concludes with Picard reading the Homeric hymns and familiarizing himself with "our stories." What story would you, could you, tell? Of Ceyx and Alcymone, Achilles versus Hector, of the labors of Hercules or the crimes of Heliogabulus? What is the alternative to investing some portion of society with its historic culture? For the West, perhaps it is a hopelessly literal society that forgoes artistic, metaphorical expression and chooses to express an emotion clinically or with vulgarity instead of with beauty. Perhaps it is an arrogant one writing heedless of Cicero or Demosthenes, or a cowardly one that prefers to medicalize parts the human condition instead of embracing or at least pondering them. (On that note, consider Adams' suggesting to his son that a poet be a companion and poetry a source of happiness.) It is generally, though, an ungrateful one that treats tradition as a burden instead of as an inheritance. The turning of Western tradition's virtue of self-criticism into self-immolation and self-repudiation is the heart of the loss of our stories. I believe Dr. Hanson has answered the why of it in his essay, so now we may ask: what have we in their stead? - List of Liberal Arts colleges in the United States. Murray, Charles. For Most People, College is a Waste of Time.WSJ.August 13, 2008. Furedi, Frank. Let's give children the 'store of human knowledge.' Spiked Online. November 18, 2009. Hanson, Victor Davis. The New Learning That Failed. The New Criterion. May 2008.